5 Minute Healthy Frosting. I love when a recipe accidentally turns into something wonderful. This is the case in this 5 minute healthy vegan frosting recipe. I made some donuts and I wanted to make a glaze to dip them in. Well the glaze ended up looking more like a frosting. So that is how this 5 minute healthy frosting was born. This is a great base frosting recipe that you can add in your own flavors too. I can see it easily becoming a strawberry frosting with a little fruit added. Or you can add some cocoa powder to make it a chocolate frosting. It was very easy to spread. I could see this frosting being a great addition to my flourless chocolate muffins. This frosting literally takes minutes to make. Hence the 5 minute frosting name. 🙂 It’s also vegan, gluten free and paleo approved. 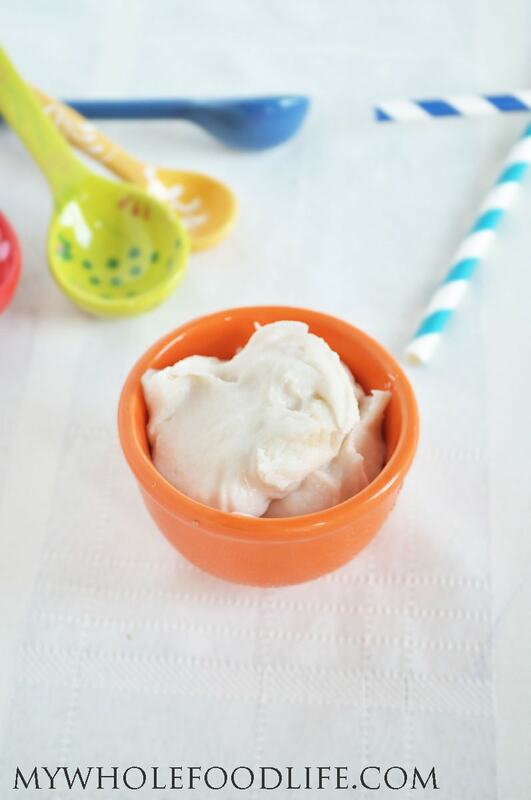 This healthy frosting recipe would make a great dairy free alternative as well. The base is made from coconut butter. I highly recommend only using this frosting right before you eat it. Once it refrigerates, it becomes hard. However, since it does become hard in the fridge, it would be a great frosting for sugar cookie cutouts. Or even frosted gingerbread cookies. A super quick and healthy frosting recipe. In a food processor , combine the coconut butter, maple syrup and vanilla beans. Then slowly add almond milk, 1 tablespoon at a time, until you reach a desired consistency. ***One important thing to note. This frosting will harden in the fridge, so it's highly recommended to frost right before serving. If you frost ahead of time, you will need to pull the cake/cupcakes out of the fridge about 1 hour before serving to soften the frosting back up. *** Enjoy! Just enough to get the consistency you desire. Love your recipes. Can you use just coconut flour or almond flour for these cookies? Coconut flour will probably not work, but almond flour may.